Sam’s a make up artist, who we’ve had the pleasure of working with before, so we were honoured to be her pick of the destination wedding photographers she has come across. We met with both Sam and Nick a few months before to discuss their plans, which is really important, especially for destination weddings. With a UK-based destination wedding photographer you can meet them in person rather than on the day of the wedding, and we can plan your shoots properly, as well as get to know you! For Sam and Nick’s wedding, it was a three-part affair; pre-wedding drinks, the wedding day itself and then a chilled post-wedding shoot the following day. All of this is included in our destination wedding photography package – as standard! The pre-wedding drinks were held at the world-famous Café del Mar, where revellers have gathered for decades to watch the incredible sunsets. It was the best location to kick off the week, for guests to catch up or break the ice, and to give everyone a slice of island life. Tom also captured the fire-eater on the beach, including this standout image. The day started with Lina joining the girls at the luxurious Ibiza Gran Hotel. One of the bridesmaids, Nicola, is also a make-up artist so was busy getting the brides and other bridesmaids ready for the day alongside Kinga from Ibiza Hair and Make Up. The bridesmaids looked absolutely stunning in different flowing dresses in shades of blush pink. Sam chose a Grecian-style Alice Temperley dress, simply wonderful with tousled hair, a golden hair crown and fern arm cuff. Flowers were in peach and blush tones, which worked well alongside the blush pink bridesmaid dresses and Sam’s floaty gown. It was a fun and busy morning with Sam’s squad of bridesmaids, just as the rest of the day would be. Tom photographed the boys over at the Hotel Gran Corso, arriving to find Nick being treated to a personal barber courtesy of his wife to be. In between stiff drinks (!) and haircuts, the groom and his entourage chilled out on the balcony, soaking up the early morning sun. As we both headed to the venue the temperatures were quickly rising, it was a very, very hot day. Thankfully the venue had a plan – parasols! These kept everyone cool during the ceremony, and made for some fun photos too. Ceremonies at Elixir overlook the Mediterranean Sea, and also the island of Es Vedra, an incredible sight on a bright, sunny day. As the guests filed in, we got some great photos of them taking in the view. Hard not to be impressed, quite the destination for a wedding! The boys arrived after winding their way across the island to Cala Codalar. Sam arrived a white vintage Mercedes, with posies on the handles – a very cute touch. The arrival was super relaxed, guests picked up a glass of sangria on the way in, as did the bride and father of the bride. More excitement than nerves here for sure. The ceremony was romantic and funny, and the location made sure we captured some charming memories for Sam and Nick. After the ceremony the guests were treated a luxury barbecue on the shady terrace, accompanied by individual cocktails, which doubled as wedding favours. Before the evening reception got underway we were able to steal away our newlyweds for couples shots by the sea, accompanied by the glorious Ibiza setting sun. Then it was time to get the party started on the party island! We stayed until the last guest left the dance floor, what an epic day. But the fun didn’t stop there…check out part two of this blog coming soon featuring Sam and Nick’s stunning Ibiza Old Town Post-Wedding Shoot. 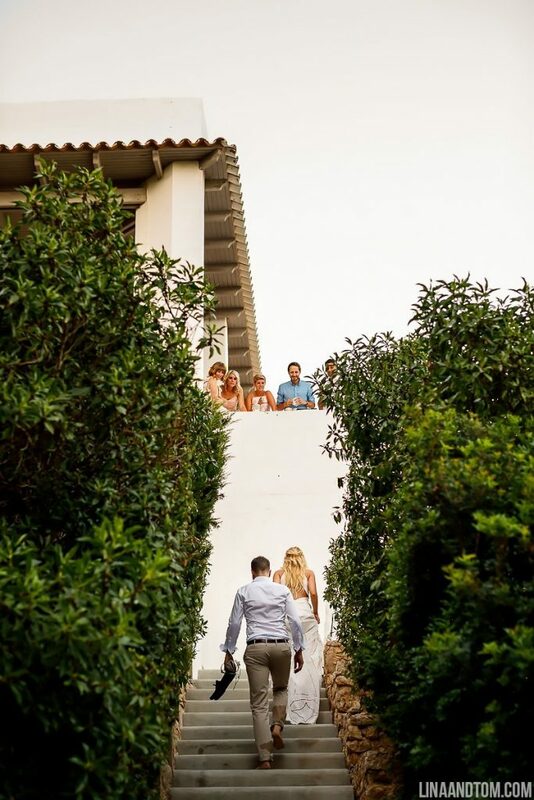 Check out Sam and Nick’s full Ibiza Wedding Photography slideshow.